In everyone's life there comes a time to recapitulate. Tarzan And The Madman was that time for Edgar Rice Burroughs. The Great Saga began in 1912 and in this novel of 1940 unpublished durng his lifetime the long strange trip, to quote the Grateful Dead, came to an end. The Big Bwana and his imposter got on a plane and flew out of Africa never to return. Two more novels would follow but they were placed in the Pacific either in or near Indonesia. 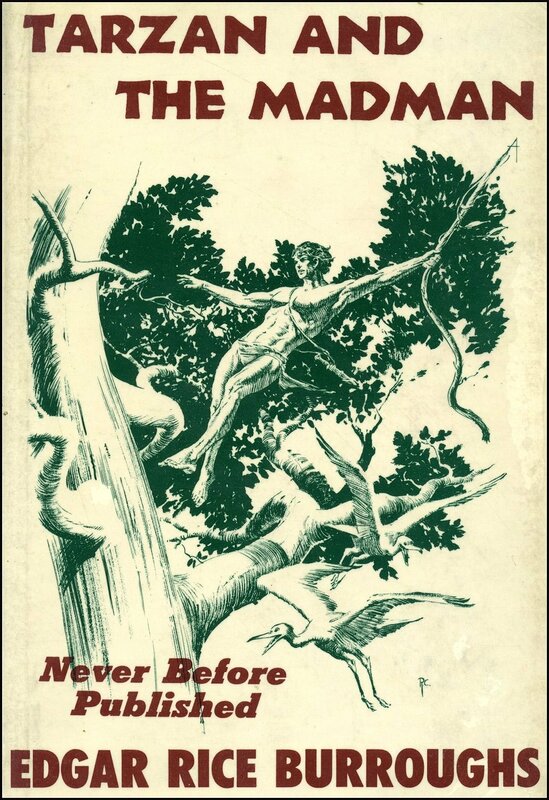 The succeeding Tarzan And The Castaways was also unpublished during his lifetime while Tarzan And The Foreign Legion could find no takers so was published by ERB, Inc. It almost seemed as though the sun had gone down on the Great Ape Man. Of course the movie Tarzan still prospered, first with the great Johnny Weissmuller and then Lex Barker. ERB even tips his hat to MGM by replicating the flight through the fog to the great tabletop of the Mutia Escarpment, an MGM invention. Thus, the last game is played out on the MGM playing field. Just as ERB and Florence left LA on a plane so Rand and the Goddess and Tarzan do Africa in this novel. In a short 157 pages ERB manages to recap the Big Fella's entire career in print or on film. In reading through the book this last time I suddenly realized the significance of all those doppelgangers. They signified the problem ERB was having realizing his ambition to be the man who was Tarzan. In Madman he gives up the ghost realizing his failure to become the Man-who-thought-he-was-Tarzan but wasn’t. Now typing away in exile from LA on Hawaii he throws in the towel. As I have tried to show in my other reviews, ERB read Robert Louis Stevenson's The Strange Case Of Dr. Jekyll And Mr. Hyde probably sometime before 1890 within a four years of its issue. The book must have been a sensation during his years at the Michigan Military Academy, the subject of endless discussions among the cadets. As hard as it must be for us to realize what we consider a classic was an exciting new book for ERB. No movies could be made of it because the technology hadn't been developed as yet. Even the primitive Nickelodeons were shimmering a ways into the future. Yea, verily, the future lay before them. The novel was significant enough to be in the first batch of talkies being first produced in 1931. I'm sure ERB was transfixed as the story unfolded on the screen. The theme of psychological doubles had dominated the Tarzan oeuvre from the beginning. While it seems repetitious to a first reading of the novels the theme is actually developing as the series progresses. ERB didn’t so much fall back on a cliche to him, but he was working out a variation on the theme of Jekyll and Hyde. He says that he was convinced that every man had two sides to his personality, perhaps not as pronounced as that of Jekyll and Hyde but there nonetheless. He was aware of his own duality chronicling it in the pages of the Tarzan oeuvre. The duality is often prompted by a blow to Tarzan's head. The blow certainly commemorates the hit ERB took in Toronto while perhaps the aftermath split ERB's personality so that he became two nearly different people. Perhaps that's the secret of his writing career as he said that he was able to disappear into the alternate reality when he wrote. Tarzan always had two personalities from the beginning. He was both a civilized man and a beast. This undoubtedly represents ERB's feelings about himself. Perhaps he had periods when he was something of a wild man, not unlike Tarzan on the Rue Maule in The Return Of Tarzan, who became a beast and then shook himself back into a human not unlike the transformation of Jekyll and Hyde. This type of duality would characterize the Russian Quartet, the first four novels. 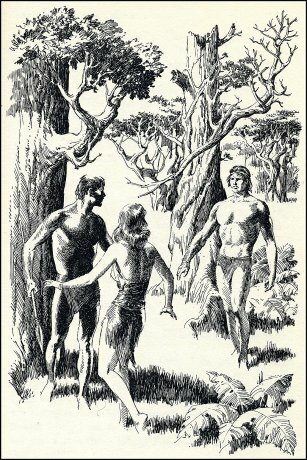 The Tarzan doppelganger first appeared in Jewels of Opar where, having received a blow to the head, he loses his memory during which he lived as an uncivilized beast, regaining civilization with his memory, but he had not yet split into two co-existing separate identities. That would first occur in Tarzan And The Golden Lion and Tarzan And The Ant Men when the great character of Esteban Miranda served as a doppelganger. Esteban was identical to Tarzan in appearance but an arrant coward compared to Tarzan. This was a characteristic of all the doubles. Esteban represented the negative pre-success side of ERB while Tarzan the positive post-success side. Thus in thse two novels ERB is beginning the attempt to become Tarzan -- The-Man-Who-Thought-He-Could-Be-Tarzan. ERB was very sensitive about his early failings in his relationship with Emma. In these two novels he offered Jane/Emma the chance to recognize him as the strong Tarzan and not the weakling Esteban doppelganger. Having overcome the failures of his past he felt he had proven himself as a man and a supreme provider demanding recognition. Given the decision to make Jane/Emma chose ERB’s former existence, Esteban, thereby sealing her fate. After her ill-fated choice Jane disappears from the oeuvre except for the chance encounter in the succeeding novel Tarzan, Lord Of The Jungle whereas the Golden Lion assumes a prominent role. While the next double, Stanley Obroski, appears in Tarzan And The Lion Man, a double of sorts in the form of Lord Passmore makes his appearance in Tarzan Triumphant. Another double appears in Tarzan And The Leopard Men when, felled by a giant tree in a storm, Tarzan blanks out assuming another persona. Also, in Tarzan And The City Of Gold Valthor serves as a double. In a strange variation ERB repeats the story of Jewels Of Opar when Tarzan rescues Jane from the Arab boma. Here, in an exact duplicate of that scene, he rescues Valthor. Thus Jane and Valthor are connected in ERB’s mind. In Tarzan And The Lion Man Burroughs kills off his weaker persona thus assuming the role of Tarzan himself. Then in Tarzan And The Forbidden City Brian is his look-a-like, although the role of double is not explored. Perhaps this is the initial realization the ERB has failed in his quest to be Tarzan. After a decade of trials and tribulations struggling against the Communists and MGM and losing, ERB sat down in exile at the beginning of 1940 to write this confession of defeat. The man-god Tarzan himself remains the same but The-Man-Who-Thought-He-Was-Tarzan but failed confesses his defeat, getting into his airplane up there on MGM’s Mutia Escarpment flying out of Africa forever. First he was expelled from Opar by the Communists and then from Africa by MGM. Although Tarzan was in the plane with him, the Big Bwana shows up again in Africa for a moment in Tarzan And The Castaways. This novel written in a style entirely different from the rest of the oeuvre was also unpublished during Burroughs lifetime, hidden away in a safe. In this novel Tarzan is defeated by a Black chief, symbolically perhaps, captured and sold as a wild man, a feral child. Once again Tarzan has lost his memory reverting to a pure beast or feral boy. As this novel was written after King Kong and Tarzan ends up on yet another island, perhaps ERB was conflating the movie with this novel. Tarzan is put aboard ship with the other animals destined for the circus and taken from the continent. Running all through Burroughs is the ghost of Jule Verne's Mysterious Island. Once aboard ship a storm assaults the ship which, signficantly loses its rudder. Thus, like the now rudderless Burroughs, the ship is adrift. In a scene reminiscent of both Verne's novel and Robert Louis Stevenson's Kidnapped the ship is tossed atop a reef while all aboard including a Noah’s Ark of animals find their way to shore as the Castaways. Stevenson and Verne were two of ERB's earliest influences thus ERB returns full circle to his origins. In the last Tarzan novel and the last published in his lifetime, Tarzan And The Foreign Legion, at the very end the fugitives from the Japanese army approach the remains of the Mysterious Island that after the volcanic explosition of Verne is a mere spire of rock in the vast ocean. Not a refuge in the world left for Tarzan or ERB. Like Capt. Nemo a submarine surfaces to rescue Tarzan and the Legion from a watery fate. It seems amazing that as an honorary Frenchman Tarzan was never placed in a situation with the real French Foreign Legion. Perhaps P.C. Wren had preempted the genre with his magnificent FFL trilogy which left no room for ERB's imagination to operate. The long odyssey had ended. ERB could not imitate his man-god, but he left him to us as an avatar for the coming New Age. What a long strange trip it was and for us, will be.